Figure 1. Vicinity Map of Project on US 421. 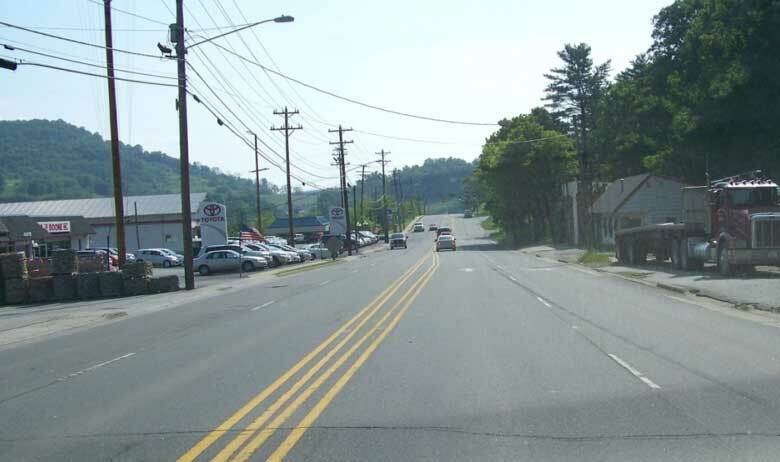 U.S. 421 on the east portion of Boone serves as a major connector to Watauga High School and Appalachian State University (ASU), and provides access to downtown Boone. The many driveways that provided access to adjacent land uses created limited pedestrian space, potential for motor vehicle-pedestrian conflicts, and limited space for bicyclists. For example, sidewalks were present only on the north side of US 421, intersections lacked pedestrian signals or crosswalk markings, and there were no facilities for bicyclists such as bicycle lanes. The U.S. 421 widening project covered a 1.1 mile portion of U.S. 421 that serves as a gateway to Boone. The project turned the road from a four lane road to a six-lane divided highway with new turn lanes, raised concrete medians, bike lanes, and improved pedestrian facilities. The project limits are the intersection of U.S. 421 with U.S. 321 (Hardin Street) to the west through the intersection of U.S. 421 with N.C. 194 (Jefferson Road) to Old U.S. 421. 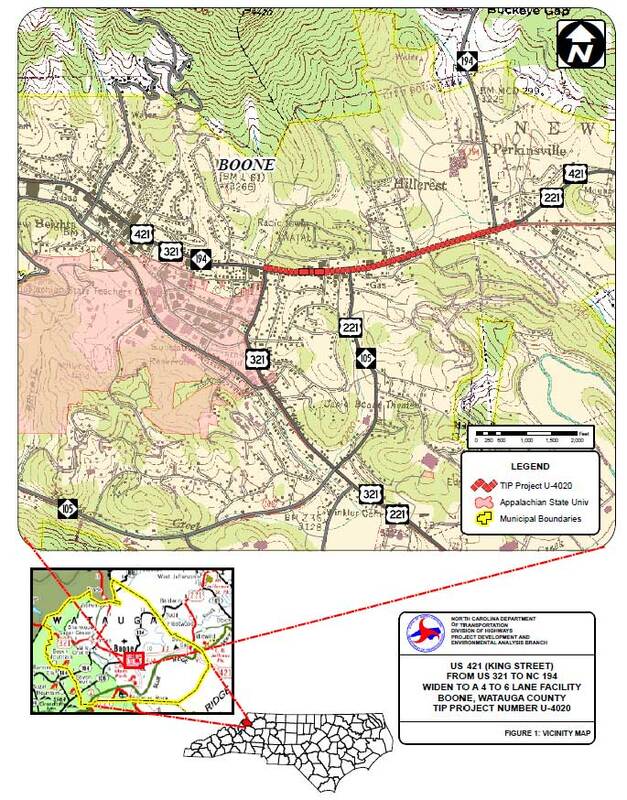 As a major connector route for regional transportation in northwestern North Carolina, NCDOT wanted to increase capacity on the 1.1 mile segment of U.S. 421 by adding travel lanes. The Town’s transportation goals for the project included improving access to Watauga High School on the south side of U.S. 421, creating a gateway for ASU-bound students, and reducing congestion. Figure 2. Eastbound on US 421 near New Market Blvd showing 4-lane section prior to project. Figure 3. US 421 after completion of project. 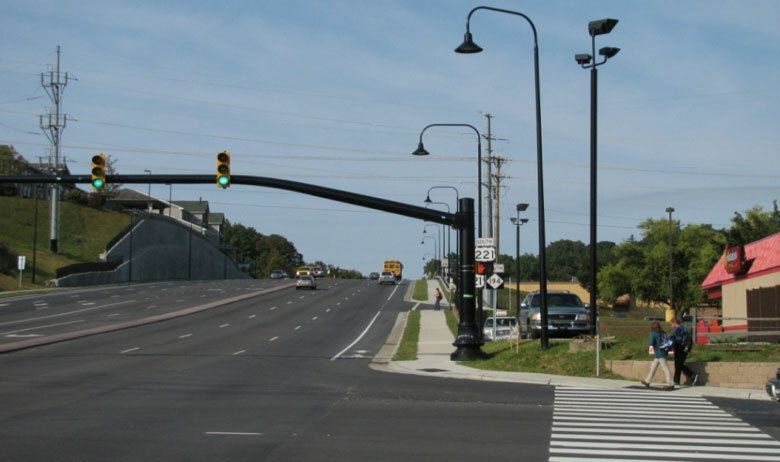 The project was designed with few pedestrian facilities, wide outside lanes to accommodate bicyclists, and standard NCDOT finishes for medians, crosswalks, retaining walls, and lighting. 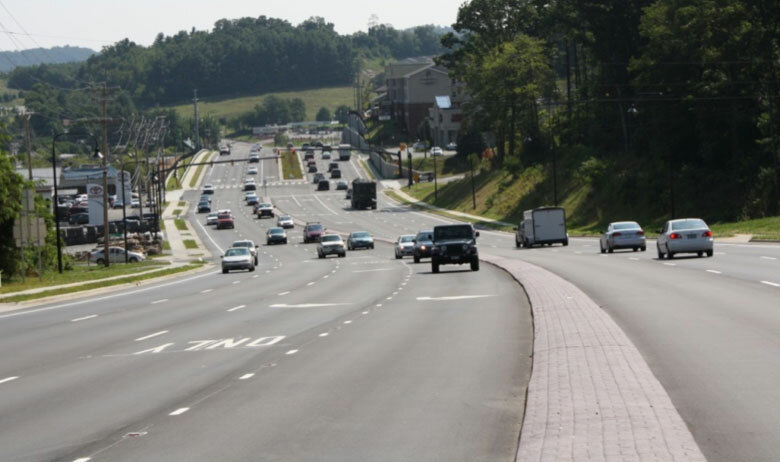 As the project neared construction, the Town of Boone and NCDOT began partnering on the final design elements, ultimately agreeing on a design that created a multi-modal roadway with enhanced aesthetics. Dean Ledbetter, NCDOT Senior Planning Engineer (Division Traffic Engineer at the time of the project), and other NCDOT engineers attended a FHWA-hosted Complete Streets training session about 6-8 months before NCDOT let the project for construction bids. The session helped them “recognize the need to reconsider the installation of marked bicycle lanes on the U.S. 421 project”. This, in turn, precipitated a larger conversation between NCDOT and the Town of Boone about making the final design ‘complete’ for all users. Ledbetter and other NCDOT personnel began meeting with representatives from the Town of Boone to discuss the need for bike lanes, crosswalks and pedestrian signals at the signalized intersections along the project. Figure 4. Westbound on 421 at NC 194 (Jefferson Road) after project completion. 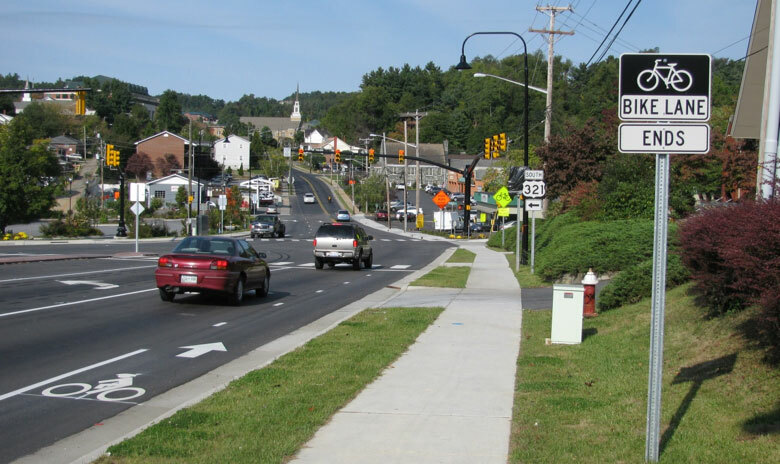 The Town of Boone’s Transportation Committee, working in support of the Mayor’s vision for the U.S. 421 reconstruction, guided the Town’s decisions towards a more multi-modal approach. The Transportation Committee, comprised of many stakeholders in the community including representatives from Appalachian State, NCDOT, Town of Boone, members of the Regional Planning Organization (RPO), Watauga County, transit, area cyclists, and at-large members, met with Ledbetter and other NCDOT staff. The decision to include bike lanes came by expanding this group to include representatives from the Boone Area Cyclists. The group met and agreed to narrow travel lanes slightly (i.e., a modification in the pavement marking plans), creating space for a 4’ lane on each side of the road. In addition to modifying the pavement marking plans, NCDOT agreed to modify the traffic signal plan. The additional cost of these changes was negligible. Ledbetter recollects that “The Town expressed a strong desire to improve pedestrian access with the widening. Existing sidewalks were replaced at no cost to the Town of Boone, but the Town shared the cost of the new sidewalk installation according to NCDOT policy”. The improvements were partially financed by the American Recovery and Reinvestment Act. This was a Transportation Improvement Project (TIP). The total cost of the project was $15,248,888, which was less than the estimated cost of $16.2 million. The Town of Boone added $1.9 million in additional funding for aesthetic improvements including painted mast arm street signals and pedestrian-oriented street lighting, upgraded fencing, underground utilities, and stamped concrete medians. Figure 5. The new road is comfortable for bicyclists. 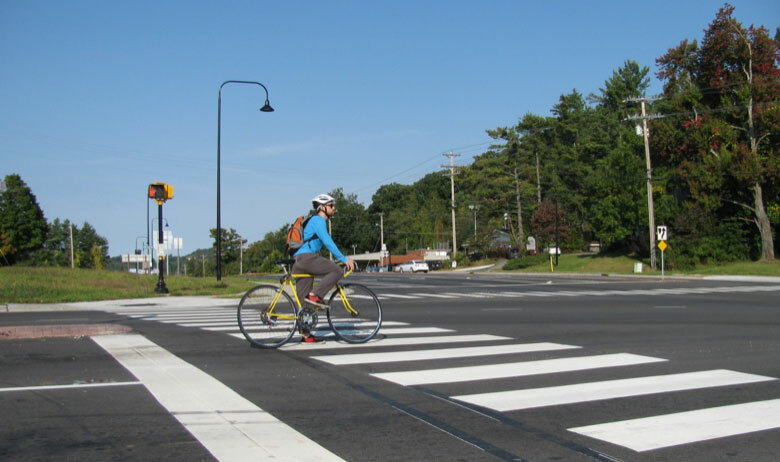 In addition to creating improved mobility for motorists, the whole project created greater accessibility for pedestrians and bicyclists through new and improved facilities. Instead of having to take alternative routes, many area bicyclists are now using U.S. 421 and some report saving up to 15 minutes in their commute times. There are additional reports of more Appalachian State University and Watauga High School students and staff using these routes. Figure 6. Bike lanes end at west end of project. The Town of Boone staff has learned the importance of carefully reviewing plans and better informing the public to decrease difficulties during and after construction. Some businesses and motorists reported that the new full length median created difficulties for them when making left-turns into business driveways. Also, there have been reports that it is difficult to make U-turns at certain intersections. Due to these issues and from other feedback, the Town of Boone is today better collaborating with NCDOT in future projects to greater benefit all road users. Beaver, T. (2013, September 24) Discussion of US 421 Widening. Brown, B. (2013, November 8) Discussion of US 421 Widening. Eller, D. (2013, September 24) Discussion of US 421 Widening. Freeman, M. US 421-King Street- Upgrade in Boone NC. Paper on US 421 Widening. April 2013. Ledbetter, D. (2013, October 28). Discussion of US 421 Widening. Treadaway, E. (2013, September 24) Discussion of US 421 Widening.